Everyone can appreciate a beautiful bunch of flowers in the house. Yet this is not for everyone. Most of the bushes can be thrown away after a week, and plants need regular watering for which the barking is a bit too busy. Within our range we have the most fantastic solution for this. We have tulips that will not wilt and which you do not have to constantly water. This way you can enjoy the cheerful colors and the atmosphere without all the extra work that can normally be seen. You will only have to dust the wooden tulips in a wicker basket once in a while to keep them nice. You don't even have to love Dutch souvenirs to appreciate a beautiful bunch of flowers like this. The great thing about this kind of wooden tulips is that they have beautiful colors and that that color will always remain that way. You can choose a color that fits nicely with your decor or a combination that simply makes you very cheerful. As soon as you take a look at the different options, you immediately see how many options there are. This may make choosing a bit difficult. A big advantage is that the wooden tulips are also available separately so that you can add them yourself and make some adjustments. This way your bunch of tulips is always completely to your liking. It is of course not the case that some flowers are put in a basket without any thought and that we will send it to you in no time. Our aim is that you can always expect the best quality and the same product. It does not matter which variant you choose. The wicker basket is always filled with 50 wooden tulips in the color that you choose. These have a height of 34 cm and will therefore stand out well in a room. So you can always expect a basket full of beautiful long tulips that really bring the atmosphere into a room. 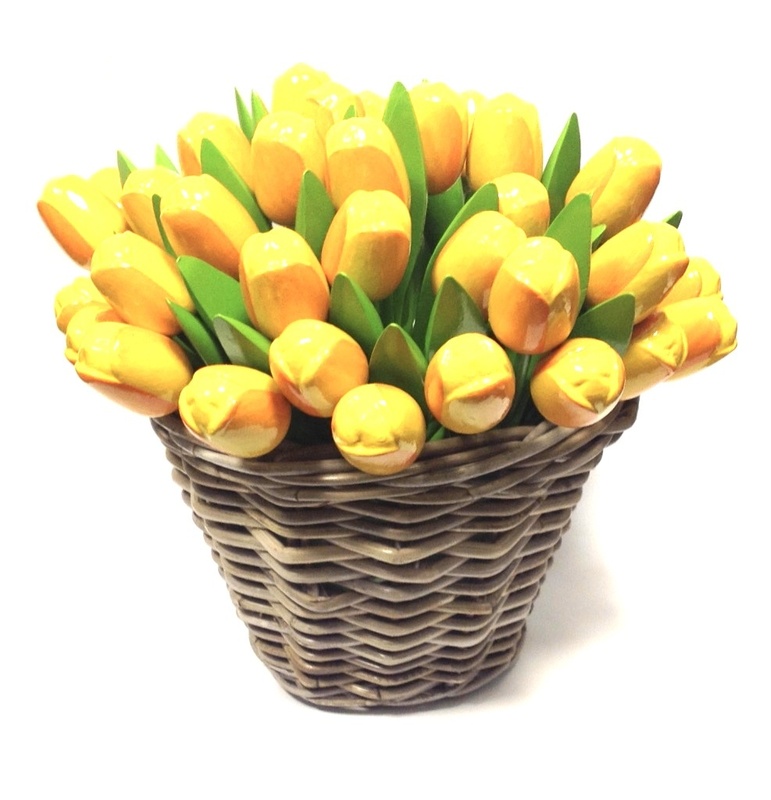 Wooden tulips in a wicker basket look great as a gift. This can be for all kinds of occasions such as a birthday, wedding or for new parents. It is an original gift to give and is suitable for everyone. There will never be problems with allergies so you can give it carefree. In addition, you are almost certain that the person receiving it has not received anything like this. They require little maintenance and therefore make the perfect gift that will end up in the back of a drawer. If you want to give a truly original and well thought out gift, then definitely choose the wooden tulips in a wooden basket. The only problem you can have with this is that you find them so beautiful that you no longer want to give them away. Fortunately we always have a large stock so that you can also choose a nice color.